LAHORE: Religious parties have warned the Pakistan People’s Party government, especially Punjab Governor Salmaan Taseer, of a rigorous protest drive if they try to release the woman convicted of blasphemy. 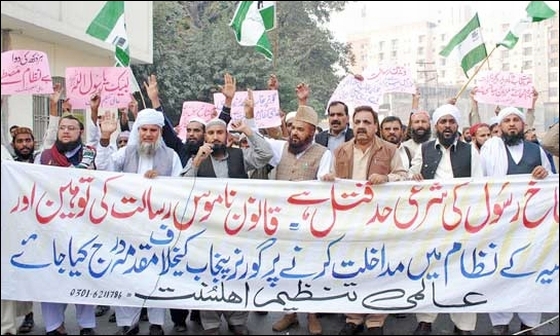 The Aalmi Tanzeem Ahle Sunnat staged a demonstration outside the Lahore Press Club on Tuesday where participants chanted slogans against Taseer for promising to use his influence to seek presidential pardon for Asia, who was sentenced to death by a sessions court judge on blasphemy charges. Addressing the demonstrators, Pir Afzal Qadri demanded the Supreme Court take notice of the governor’s interference into the judicial system and disqualifying him to hold the public office as, what Qadri said, Taseer had proved himself to be an enemy of the religion by declaring the blasphemy law as ‘black law’ and the verdict a “cruel judgment”. Other speakers demanded that President Zardari should refrain from hurting feelings of the Ummah by granting pardon to the convict otherwise a protest drive would be launched against the government. They announced observing Friday (Nov 26) as a protest day against the governor’s statement and his intention to seek relief for the convict. Jamaat-i-Islami (JI) amir Munawwar Hasan has also condemned the campaign launched by the governor and the country’s secular lobby for the release of Asia, and said the nation would foil every conspiracy to abolish the blasphemy law. In a statement, he said any such attempt would prove to be the last nail in the coffin of the PPP government. He said the JI would consult other political and religious parties to chalk out a joint line of action against the secular lobby’s designs. Besides some foreign powers, the secular lobby and the foreign-funded NGOs having ‘anti-Islam’ and ‘anti-Pakistan’ agenda were pressurising the government into releasing the convict in a blatant interference in the country’s judicial system and its internal affairs, he alleged. He said none of the human rights or women’s rights bodies had made any protest when a US court sentenced Dr Aafia Siddiqui to 86 years in jail without any proof and no ruler, including the governor, felt any sympathy for her. However, on the conviction of Asia, Taseer promptly reached the jail to ensure “justice” to a blasphemer and even President Zardari hinted at releasing her, the JI chief lamented.